We're late, gomen, with the E3 and all... don't worry missing it though, you'll soon wish we had not publish it. Nintendo, the world leader in video game innovation, stated loud and clear that they are not to be overlooked in the next generation home console race with the revelation of several unique features of the company's next console system, code name Revolution, to key media outlets. According to the early information, Revolution will combine powerful technology and gaming-focused features in Nintendo's smallest home game console yet. In its final form, Revolution will be about the thickness of three standard DVD cases and only slightly longer. The versatile Revolution will play either horizontally or vertically, allowing the user total flexibility in setting up a gaming session wherever they have a television. Thanks to Nintendo's hardware development partners IBM and ATI, the small system will be packed with power that will enable it to wow players with its graphics. Nintendo's legions of loyal fans will be happy to learn that Revolution will be backward compatible, playing both Nintendo GameCube 8cm disks along with its own 12cm optical disks in the same self-loading media drive. In the next generation, the addition of the Internet will be important to all consoles and particularly important to Nintendo. Revolution will be wireless Internet ready out of the box. There's much more to Revolution that will be revealed over the coming months, but the combination of its compact size, wireless Internet, backward compatibility, quick start-up time and quiet, low-power operation add up to the start of a great game system. Get ready for the Nintendo Revolution in 2006! However, as the release mentions, those are "early information" and most likely subject to change. It's hard to imagine the console could be as small as described. Partial Nintendo's 2005-2006 Line-up Unveiled ? A couple of sites report a list which could be a glance at Nintendo's line-up for the year to come and might contain several games to be unveiled during the E3. The list introduces new titles as well as new names for already know titles, among which the next Zelda; you knew it as Reins of Sorrow, Gates of the Realm, now you will know it under the name "Twilight Princess"... until, hopefully, someone announces this is another fake title. The strangest thing in this list is probably two Metroid titles for DS and yet no Metroid Prime Hunter ! Samurai Nintendo vs IGN ? Now, that's something funny. 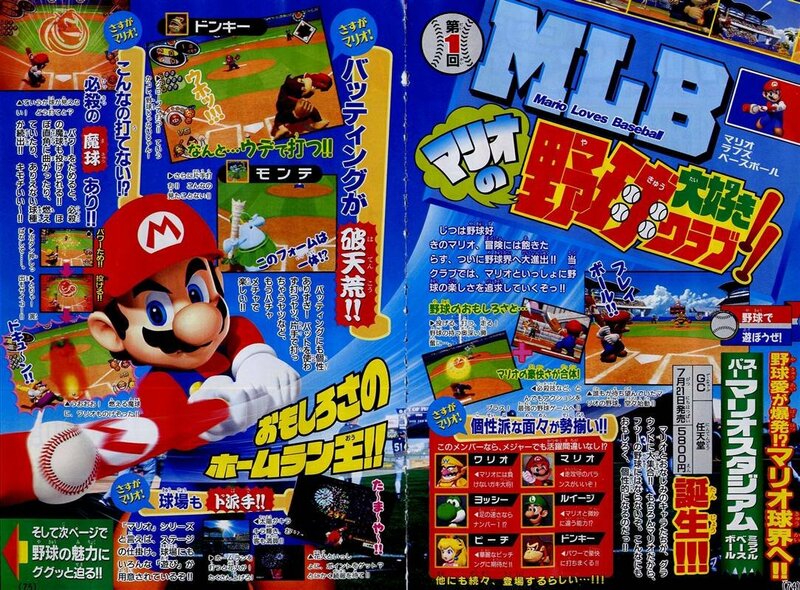 Earlier this week Samurai Nintendo claimed to have some exclusive information about Namco-Nintendo's Mario Baseball title, we said we knew the title and the release date, respectively Super Mario Stadium: Miracle Baseball and July 21. For once that we had something the others didn't (it happened before though, but at the time we were even smaller than we are now), I decided to write to several gaming sites to tell them about this news item and ask for credit. Most of them chose to ignore it, but a few courageous sites (Cubed3, Joystiq, Ve3d...) chose to publish the information, and rightly so, because even though I refuse to disclose my source, I swear it is a fact. But here is the funny thing, IGN reports the title of the game is actually Mario Loves Baseball ! You can clearly see the words on the paper, no mistake, but it is definitely not the title of the game. 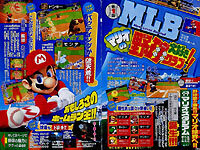 This Mario Loves Baseball is probably nothing more than a pun from the writer of the article who thought it would be amusing to translate the MLB (Major League Baseball) into this three-words valentine. So where is the actual title, the one we spoke about, Super Mario Stadium: Miracle Baseball ? You can see it in the bottom-right corner, in the green frame, near the features table (where you can read the game is coming for GC, that the maker is Nintendo, that the price will be 5800 yens and that the release date will be, as we had said, on July 21). Of course, to read it you will need some knowledge of Japanese, which is more difficult and less tempting than reading Mario Loves Baseball and jumping to conclusions. The Golden Week has come and gone and here are the results for these two weeks. Nothing outstanding for the GameCube though, handheld sold way better than home consoles. Japanese site Nintendo Inside reports that Hudson is working on its annual Mario Party title which might be on display next week, during the E3 (Mario Party 6, last year, was not shown at all). Besides Mario Party 7, Hudson will introduce later this year a new Momotaro Dentetsu (no system specified) and a Tengai Makyo II title for DS. Nothing very original, sadly. In what is becoming a habit, this week got its share of facts and rumours about the mysterious Revolution. First, conflicting reports from established sites keep arriving regarding what Nintendo plans to show of the Revolution this E3. Some sites (like Eurogamer) say there will be nothing else but a rolling video and Nintendo will focus on its handheld instead, others (like IGN) say we might see everything but the controller, along with the official name and the specs. And everyone seems convinced to be right, quoting insider sources. The truth is maybe that Nintendo is perhaps still hesitating between which part to show to the public and which part to show behind closed door. Surely the timing of the key announcements has to be well planned or it might just ended up being crushed under the wheels of Microsoft's and Sony's giant hype machine. Yesterday, MoSys Inc. revealed they will continue their partnership with Nintendo and supply the Revolution with an embedded 1T-SRAM, the memory technology which equipped the GameCube. But they also slipped an important hint: the presumed date of the console release ! And according to their chief executive, Nintendo's target is to release it in the mid of 2006, so in about a year. Unlike Shikigami no Shiro, another shooter which didn't make it outside Japan, Chaos Field Expanded is reported by IGN to come stateside in the end of summer, the publishing rights, however, will move from Sega to Q-3. Chaos Field is expected to be playable next week at the E3. Mega Collection Bis. The winds are carrying another rumour to our ear, this time about a new Sega Mega Collection coming exclusively to Nintendo GameCube. GC exclusive you say ? Like the one later released for Xbox and PS2 with additional bonuses ? Well, this one might be really exclusive, granted the GC version sold the best by far. The Sega Mega Collection 2 is rumoured to feature among other treats: Sonic CD and Sonic Fighters. Wait and see (one week to go). Homeland. What's the connection between Chunsoft's exclusive GameCube RPG and Nintendo's old archrival ? There was none until a couple of days ago, since then Sega has become Homeland's official publisher and will bring the game to Japanese retailers this June. Before Sega came to the rescue, Homeland was supposed to see a limited release through Chunsoft's website only, an embargo-like situation which would have seriously compromised its chances of success. A big thanks to Sega for the help, which hopefully will be profitable to them and, to us, frustrated faraway fans hoping for a translated version to be released. The only embarrassing question in this matter is why the help didn't come from Nintendo ? There were many reasons for Nintendo to support Chunsoft to reach a broader market with Homeland, one of them being their own commitment to sustain the GameCube as long as possible. Yoichi Wada, president of Square-Enix, commented yesterday's interview of his peer, Satoru Iwata. He expressed his interest for the WiFi and the Revolution, describing the latter as "a system which is not just carrying on but is a new platform." He also added that "from now on, in regard to Nintendo's plans (WiFi and/or Revolution ? )", we will continue providing games and backing up Nintendo strongly." Are Nintendo and Square-Enix getting close again or is it just the usual polite terms between Japanese companies in good social terms ? We're a bit unsure at this point, and only the E3 will tell if Final Fantasy Crystal Chronicles for GameCube and Egg Monster Heroes for DS were just the hors d'oeuvre before the feast Nintendo and RPG fans are all eagerly waiting for. One thing however is worth noting, no matter the implications: one day after Satoru Iwata's speech, Wada is reacting, and reacting positively. Our bet that it's no coincidence. Revolution-DS Wireless Connection Confirmed ! In an interview with Japanese website Game Watch, Nintendo's president Satoru Iwata confirmed the DS will connect to Nintendo's next home console, Revolution. The connection will use the WiFi capabilities of the DS to allow wireless communication between the two systems, unlike the GameCube and Game Boy Advance which required the use of an additional cable. Nintendo also confirmed that, in addition to the 1000 Access Points soon available in Japan which will provide Internet access and online play for the Nintendo DS, people will also be able to connect directly their DS to the Net by using a computer equiped with a router. Even more exciting news, Iwata admits Nintendo is actively studying ways to offer interaction between players worldwide, although details at this point remain scarce, more will be unveiled during this E3. The bad news is that the DS online play might come at a cost: a monthly fee, at least for some third-party titles. New Nintendo Franchise: Super Mario Stadium ! Note this exclusive information was first published on Samurai Nintendo. Nintendo today unveiled a new franchise called Super Mario Stadium which might corroborate rumored games such as Mario Soccer and Mario Dunk Shot actually exist. The first game to be puslished under the franchise name is none other than Namco-developed baseball game which now bears the final title "Miracle Baseball". Super Mario Stadium: Miracle Baseball will release on July 21 in Japan, just one week after Dance Dance Revolution with Mario, and more importantly, one week after Konami's popular baseball title Jikkyou Pawafuru PuroYakyuu. Summer is going to be hot indeed. Bandai Namco Merger Announced ! » Namco Bandai Holdings, What does this mean for Nintendo?